FINE GAEL MINISTER Pat Breen has spoken for the first time about his involvement in a controversial dinner he attended at the National Broadband Plan bidder David McCourt’s house with former Communications Minister Denis Naughten. Last week, the junior minister admitted to have met with David McCourt, head of the only consortium left in the running for the National Broadband Plan tender, on a number of occasions. The Minister of State with responsibility for Trade, Employment, Business, EU Digital Single Market and Data Protection admitted to extending a dinner invitation, at the request of McCourt, to the then communications minister. The dinner was held in McCourt’s own home, which is just a few miles from Breen’s own house, he said. Breen said he does not have any role in the broadband plan – worth €500 million. He said at no stage was the project discussed by Naughten or McCourt at the dinner he attended, he said. Taoiseach Leo Varadkar and Health Minister Simon Harris have defended Breen in the last couple of days. When Varadkar was asked by TheJournal.ie on Monday about whether he accepted Breen’s explanation, the Taoiseach said he did. “I spoke to Pat Breen about it and Pat Breen’s explanation, which I accepted, is that Mr McCourt asked him to pass on the invitation, which he did. Pat, at the time, asked Denis Naughten as to whether it was okay for that meeting to happen, and it did. The health minister has also come out batting for Breen, stating that Breen had merely asked a minister to meet a local constituent. Breen has said McCourt – the man bidding for the half a billion Euro contract – lives just 10 miles away from him. “Pat Breen asked a minister to meet a constituent, a neighbour, and Denis Naughten decided to do that,” said Harris. After the fallout of Naughten’s resignation, Breen said he has gotten to know McCourt on “a personal basis” and has visited his Co Clare home several times. He said he has also met him on other occasions in a private capacity. Despite support from his party colleagues, members of the opposition have said Breen’s explanation of events are not good enough, with some such as Green Party leader Eamon Ryan questioning why Breen did not speak up about the dinner at MCourt’s house with Naughten, when the communications minister was facing intense questioning about a dinner he had with McCourt in New York. At this point, the Dáil nor the Taoiseach were aware of further meetings, yet Breen remained silent. This week, Fianna Fáil leader Micheál Martin said Breen’s answers were “not credible”. Meanwhile, Breen’s constituency colleague Clare Independent TD Michael Harty has called on the junior minister to address the Dáil on the issues he has found himself embroiled in. This week, TheJournal.ie asked Breen’s office, as well as the Fine Gael Press Office, a number of questions about the junior minister’s relationship with McCourt. At the time of publication there has been no response from his office. A response from Fine Gael Press Office merely pointed to the statement released by Breen last week adding there would be no further comment. Email “'I've done nothing wrong': Pat Breen defends extending dinner invitation to broadband bidder's home to Naughten ”. 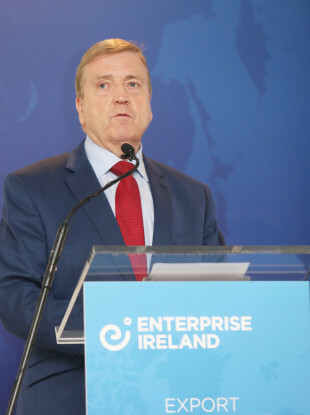 Feedback on “'I've done nothing wrong': Pat Breen defends extending dinner invitation to broadband bidder's home to Naughten ”.